This Twinkling H20s Tutorial will show you how to get a real shimmery look to your creations. This product will give you some lovely effects on your cards and they are very pleasant and easy to use, Ideal for the beginner. 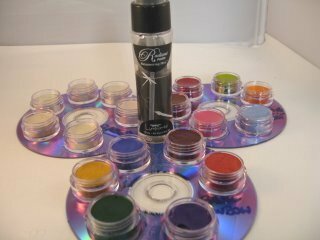 They are water based cakes of paint that have Mica Powder in them for the sparkly look. The range of colours is amazing and the quantity of Mica Powder in them is second to none. You can buy Mica paints cheaper but the quality is not there and the results will be disappointing. And this is an excellent Storage Idea I used an old CD case and glued each pot in its group to an old CD ... then layered them up into the holder. Remove the tops from the pots that you need to work with and leave the rest hard until you need the. That way you can be sure that you won't spill them and waste the precious paint in each little pot. 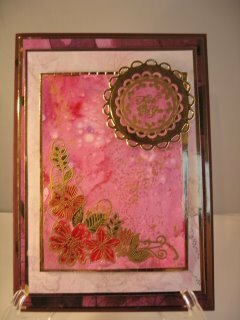 When they are ready to use then the idea in this Twinkling H20s Tutorial maybe one that you will enjoy. Experiment with these paints and you will be very pleased with the results that you get. Use them to colour in your stamped images too especially to highlight some clothing. Adding the paint to a plain white tile and spritzing regularly with the water will make your paint go even further and give you really good value for your hard earned cash. I hope you will try this product and that the Twinkling H20's Tutorial has given you some ideas.